Few exercises build more upper-body strength than a traditional pullup, in which you hang from a suspended bar and pull yourself up, using your own body weight as resistance. The simple motion strengthens the arms, shoulders, chest and back. 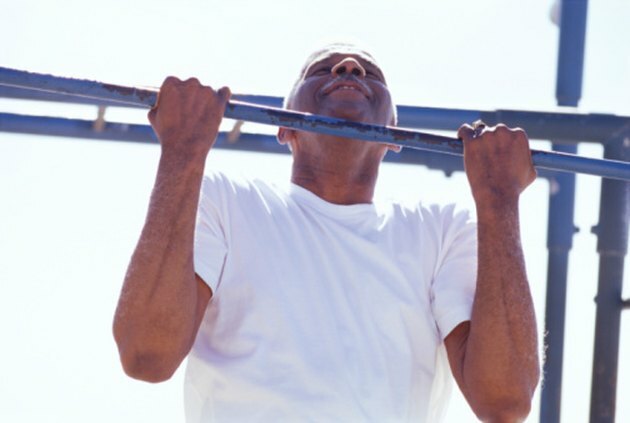 You may also modify the pullup to target specific muscle groups and to add variety to your workout routines. In a classic pullup, grip the overhead bar with your palms facing away from you. In a chinup, grip the bar with your palms facing towards you. The grip adjustment places more stress on the biceps, helping build bigger, stronger arms. Simply altering the width of your grip will have a tremendous effect on pullup performance. Grasping the bar with your hands closer together will place greater emphasis on the arms, shoulders and chest. Grasping the bar with your hands farther apart will work the lat muscles of the back. In a commando pullup, turn your body and stand so you’re looking down the length of the bar. Grab the bar with your palms facing each other in a staggered position. This is known as a neutral grip and places less stress on the shoulders. When you pull yourself up, you’ll have to move your head to one side or the other to avoid hitting the bar. Alternate sides with each rep. Commando pullups target the arms and chest. To perform a dead hang pullup, lower your body until your arms are completely extended at the bottom of each rep. Allow yourself to hang until all momentum is lost before pulling yourself back up. This adds a greater degree of difficulty to the exercise. While they shouldn’t be attempted by those with rotator cuff problems or existing shoulder issues, behind the neck pullups blast the shoulders and upper back, providing an intense workout. Instead of pulling your chin over the bar, you duck under and lift your head up on the other side, touching the bar to the back of your neck.